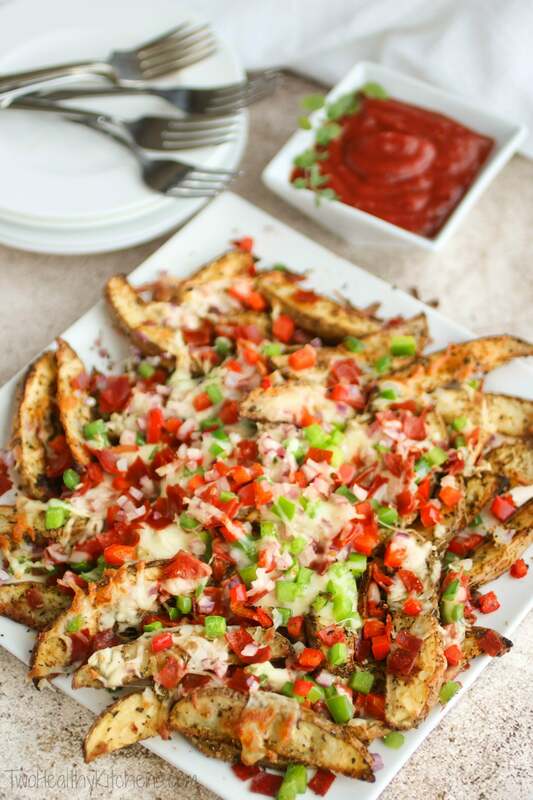 These baked french fries are so easy to make, and always a total hit! 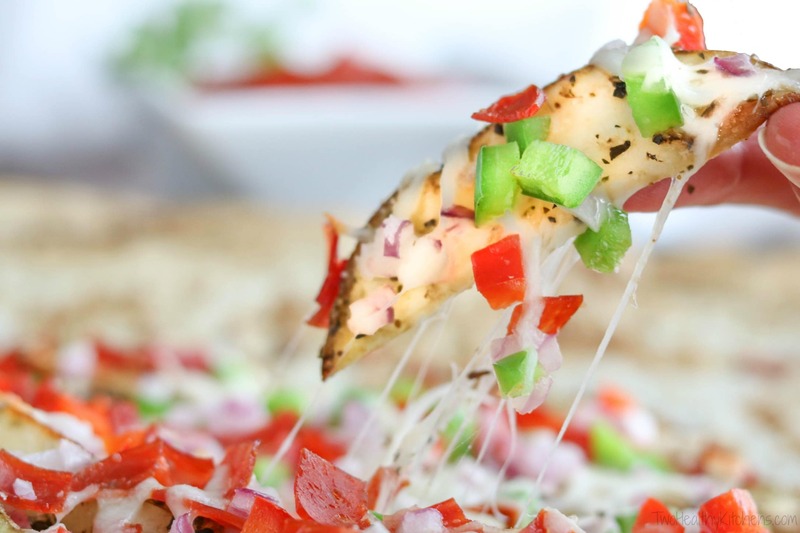 They’re loaded with awesome, cheesy pizza flavor and they’re healthy, too! Roast ’em, Don’t Fry ’em – The first thing I had to do was just ditch the frying. Obvious, right?!? And totally easy! Roasting potatoes at a high heat in the oven produces a wonderful, crispy, golden-brown exterior and a fluffy interior. 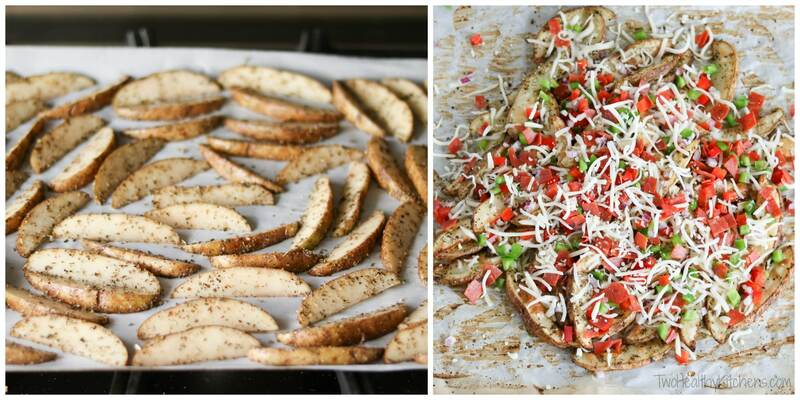 So much great flavor and texture without the frying! 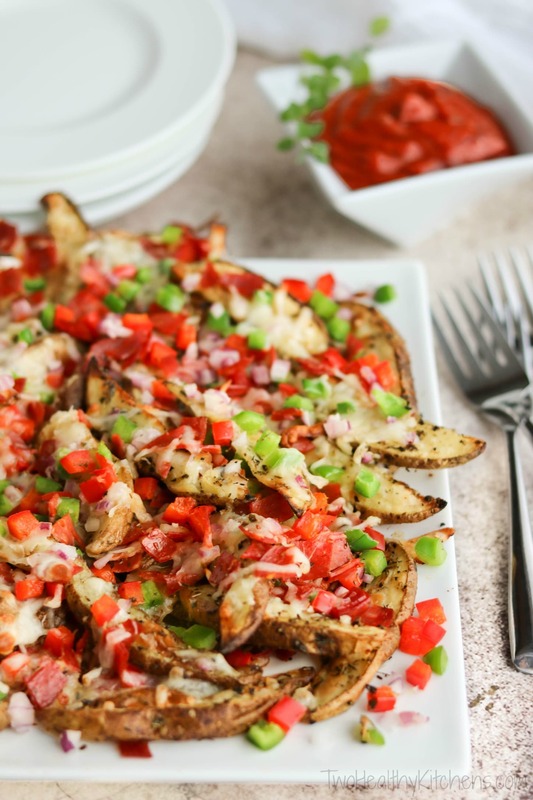 Load ’em Up (the Right Way) – These Pizza Fries get a big wallop of flavor from antioxidant-rich spices. Yum! Tasty little antioxidants! 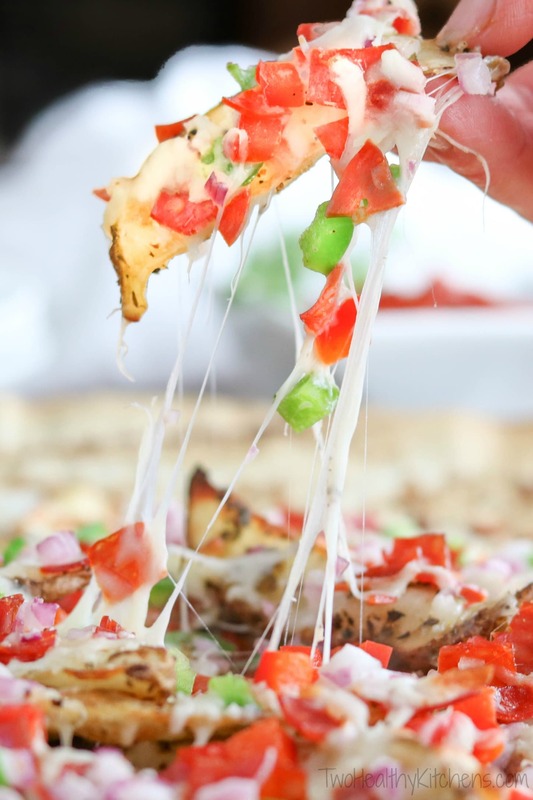 And, dipping your fries in pizza sauce offers up even more layers of awesome pizza-y flavor, plus great lycopene from the cooked tomatoes. One of the best ways to healthify practically anything is to start by looking for ways to add in more veggies. 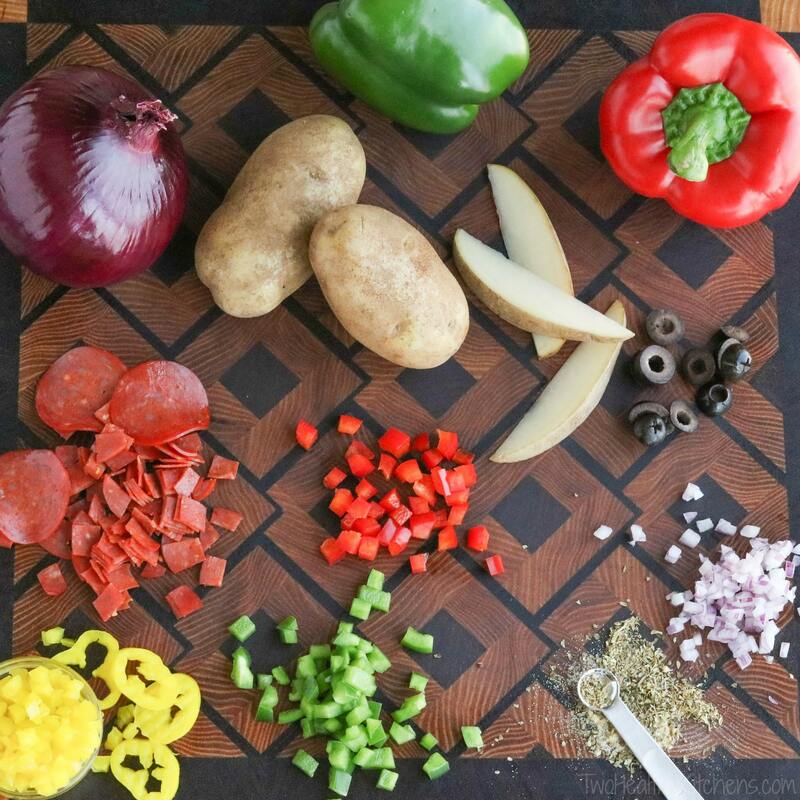 Colorful peppers and onions are fantastic additions, and you can add anything else you like, too – think mushrooms, tomatoes and olives. And sure, you can add some pepperoni or sausage if you’d like. Just be sure you go with reduced-fat options like turkey pepperoni, and try to focus more on the veggies than the meats! 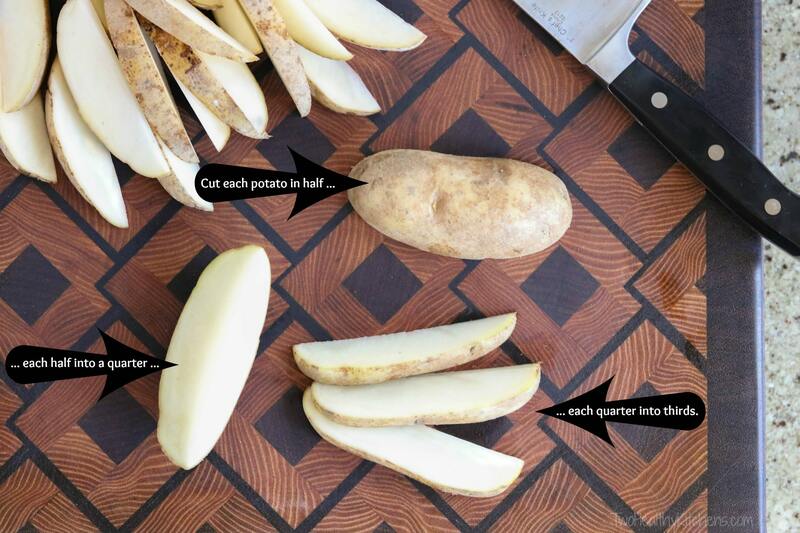 Potato Equality – What’s most important when cutting your potatoes is ensuring that – whatever size and shape you decide on – you make all your potato pieces as similar in size and shape to each other as possible, so they all bake evenly in the oven. Potatoes Like Their Space! – You know why potatoes are grown on big, spacious farms? 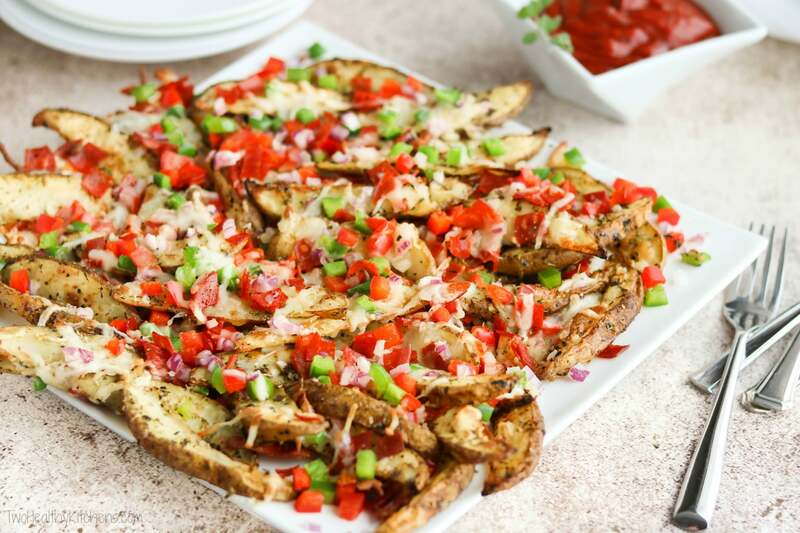 Because they definitely like their real estate, especially when it comes to oven-baked taters! Another big key to Pizza Fry success (or success in roasting any veggie) is spreading your veggies out on the baking sheet. Our big 14×17″ baking sheet is at maximum capacity with about 1 1/2 pounds of potatoes, but you can see that there’s still just a little space between each french fry. That’s critical for good roasting. If veggies are piled on top of each other or closely touching, they tend to steam more than roast, and you’ll miss out on that crispy-crunchy-golden exterior we’re going for here. If you feel like your baking sheet is too crowded or you want to make a double batch, just use two baking sheets instead of thinking you’ll be ok cruising by with only one.